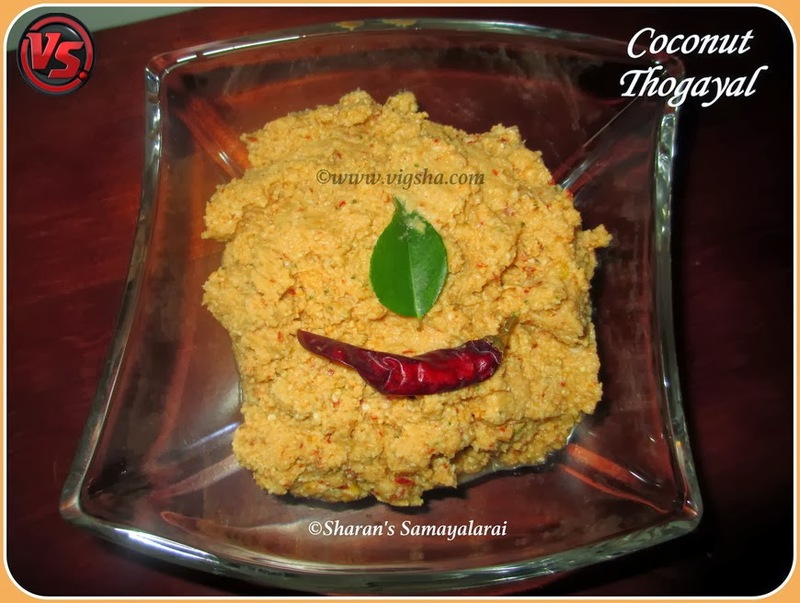 Coconut Thogayal is a tasty & quick rice accompaniment which does not require any cooking and can be prepared in 3 minutes on a lazy day. Whenever DH is not taking lunch, I will feel very lazy to cook. Immediately, I will call up mom and ask for a quick recipe. She would suggest some simple recipe and that's how I got this recipe. This is my favorite childhood recipe. 1). Grind everything together to a thick and coarse paste. Do not add too much water. Top the thogayal with a dollop of ghee and serve it with steamed rice and appalam or poriyal. # Thogayal's consistency should be thick and semi coarse so add only little water and grind it coarsely. # If you have left over thogayal store it in the fridge or dilute in water and use it as a sidedish for Dosa/Idli varieties. # If you are calorie conscious, use gingelly oil instead of ghee.